18-hole golf course; spa; health club; movement studio; outdoor pool; Nordic skiing; snowmobiling; two restaurants; and the popular Lobby Lounge. and shopping in downtown Park City. Amid the towering Wasatch Mountains, Hotel Park City brings world-class luxury to a classic Old West setting. 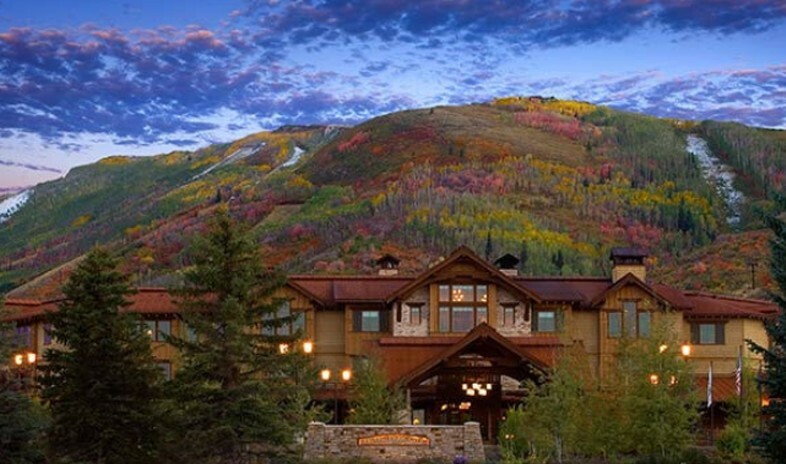 A member of the Autograph Collection, the hotel provides a year-round retreat in the heart of historic Park City, surrounded by the Park City Golf Club and some of the best skiing powder on the planet. Scenic views dominate 24,000 square feet of indoor and outdoor function space, where high-speed internet access and up-to-date audiovisual equipment facilitate even the most demanding presentations. Lawns and the pool terrace provide multiple venues for alfresco receptions. For private dining, the Crescent and Wasatch Rooms offer spectacular settings. Groups also enjoy the legendary cuisine of Ruth’s Chris Steak House and casual fare at Bandannas Grill & Bar. At cocktail hour, the Lobby Lounge is a popular spot, with a fireplace and views of the neighboring ski runs. The hotel offers Nordic skiing on-site, plus world-class Alpine skiing at three resorts just five minutes away. Warm weather ushers in fly-fishing, horseback riding, hiking, and mountain-biking adventures. During meeting breaks, the year-round heated pool beckons, as does the spa, which offers luxurious body treatments and dry and wet saunas. All 99 suites come with fireplaces, private patios, and kitchen facilities. For the ultimate in convenience, the spacious Cottage Suites sit 130 yards from the Silver Star ski lift. I was not on site, but my facilitator reported that HPC was excellent and he would recommend it. The entire group was very complimentary of the venue. Food service is very limited and all meals have to be catered or hosted by Ruth Chris Steak House. No room service but the rooms are spacious with kitchens and sitting areas. I wanted to let you know how much the Rotary International Board of Directors enjoyed their stay at Hotel Park City for their recent retreat. I have heard nothing but superlatives in the descriptions of the food, rooms, staff, and locale. PARK CITY, Utah " September 29, 2008 " Exceeding expectations and the needs of our guests who wish to book private function space, as well that of our event and meeting planners has been the driving force behind our decision to build-out additional ballroom space," said General Manager Guy Morris. The 3000 sq. ft. 4-Seasons Ballroom at Hotel Park City opened late September. This addition complements the already versatile and spacious indoor and outdoor event space at Hotel Park City, bringing the Hotels total event space to over 24,000 square feet. The 4-Seasons Ballroom at Hotel Park City accommodates up to 200 people in a variety of event settings including weddings, receptions, banquets, theater style, school room and trade show set up. Located in the main Hotel lower level, adjacent to The Spa at Hotel Park City, the ballroom is easily accessible and offers a covered foyer entrance which keeps everyone warm and comfortable during those snowy days and nights. The dcor of the 4-Seasons Ballroom is a continuation of the luxurious lodge theme found throughout the existing event salons and meeting rooms. The ballrooms amenities include wireless internet and centralized sound system. Suited for groups of 10 to 200, Hotel Park Citys main floor, second and third floor event space includes flexible salons and meeting rooms with scenic views and technology that accommodates the most demanding presentation and communication requirements. Experienced support is on site to respond to every need. The Hotel's spectacular golf course and spacious rose garden setting also offer unrivaled opportunities for outdoor receptions or functions; access from the lobby to the lawns, restaurant terraces and pool terraces is effortless. To book any of our beautiful and spacious event salons or ballroom, or to learn more about Hotel Park City, visit hotelparkcity.com or call toll-free 888-999-0098 or direct 435-940-5000.